Teen Vogue has an impressive track record when it comes to spotting talented young women. The Conde Nast-owned glossy featured Jennifer Lawrence on its cover before she ever starred in a movie, and Ariana Grande when she was still more famous for her Nickelodeon sitcom than her singing career. But Vogue‘s younger sister has perhaps an even keener ability to unearth models before they become runway regulars and household names. Who can forget the February 2008 cover featuring a baby-faced Karlie Kloss, Ali Michael and Chanel Iman? So it’s worth paying attention whenTeen Vogue says it’s identified the three most promising young models on the market. 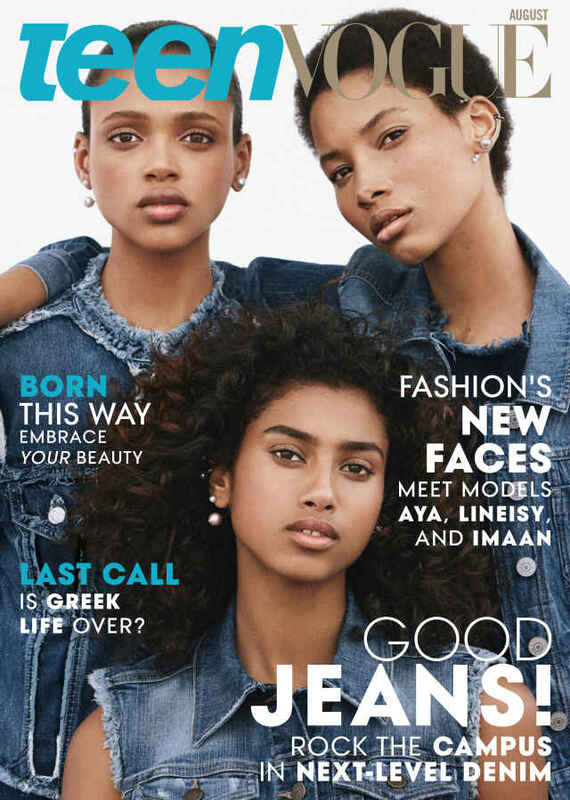 Aya Jones, Lineisy Montero and Imaan Hammam, who grace the mag’s August cover, aren’t just notable for their runway resumes and genetically blessed bone structures. In an industry that notoriously favours white models, it’s remarkable that not one of these young women is, in fact, white. Jones was scouted on the streets of Paris, where she grew up, and has walked in 47 runway shows since her exclusive debut for Prada’s spring 2015 show. Montero, who was discovered at an amusement park in Santo Domingo, made her own exclusive debut for the Italian house the following season. Hamman — half-Moroccan, half-Egyptian and born in Amsterdam — appeared on the foldout cover of Vogue‘s “Instagirls” September issue and is versatile enough to have already appeared on the Victoria’s Secret runway and a Givenchy campaign. Now crowned as “fashion’s new faces,” the only way for these models to go is up.